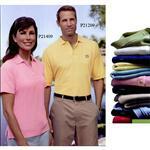 Top of the line microfiber polo shirt for the active lifestyle. 100% polyester, 5 oz. Vansport™ moisture management microfiber mesh body with soil release, antimicrobial and UV protection properties, self-goods collar, three-button placket, dyed-to- match matte buttons, hemmed sleeves, single-needle top-stitching, hem bottom with curved dropped back, replacement button. Imported. XS-3XL. We love to help compare textures and weights and this velocity polo is a nice quality shirt.. We're fun to work with, are based here in America and we really know our clothing. Pricing varies depending on the decoration and quantity, please inquire! Please call 888-332-ADCO for pricing on our clothing – we help make sure you get the best quality apparel for your budget. Clothing often goes on sale – email your logo and quantities to sales@adcomarketing.com and we will get with you right away to discuss pricing and timing for your needs. Typical Imprint Area(s): Front, sleeve, back.